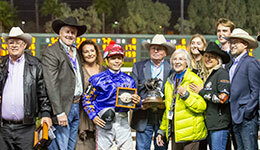 Kr Hi Five earned his second stakes win in Saturday's John Deere Juvenile Challenge Championship. LOS ALAMITOS, CA—NOVEMBER 17, 2018—Sent to post as the 7-5 favorite in a field of nine 2-year-olds, Kr Hi Five responded with a three-quarter length victory in Saturday's 350-yard, $125,000 John Deere Juvenile Challenge Championship (G2) at Los Alamitos Racecourse. Singles Cruise, Loan Sharky, Chasin Harm, Maghelene, and Fames Prize Stone. 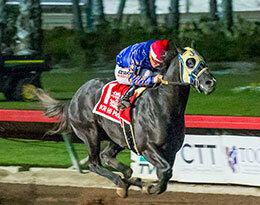 Capitol Grille was listed by Equibase as a veterinarian scratch.